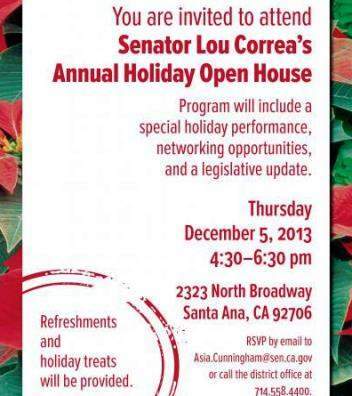 (SANTA ANA, CA) – Senator Lou Correa is hosting the District Office Holiday Open House on Thursday, December 5th from 4:00 to 7:00pm at 2323 N. Broadway, Santa Ana, CA 92706. Orange County residents are invited to enjoy a delightful after noon with Senator Correa, local community friends and constituents to celebrate the spirit of the holidays and the businesses in the community. As this time of the year inspires sharing, giving and celebration for the blessings we’ve received, Senator Correa encourages the same for the community at the Holiday Open House. It gives people the opportunity to talk to Senator Correa about what is currently happening and what could be done to give back to the community. It is also a time to celebrate the collaboration between partners in the community that have increased the blessings in our community. There will be legislative updates given by the Senator and an opportunity to meet the staff and talk about the services and work they provide to constituents and the community. This event will include the honoring of several deserving community leaders. On the second floor, in suite 245, the District Office will be open for your viewing enjoyment and will be nicely ornamented in Holiday Season decorations. In the board room, located on the first floor, diverse tasteful food snacks will be provided from local American, Mexican, Salvadorian, Chinese, Vietnamese and Cuban restaurants. You will be joyfully entertained by local artists in the community as they provide Holiday music throughout the event. For more information, please contact with Asia Cunningham at District Office (714) 558-4400 or email Asia.Cunningham@sen.ca.gov. 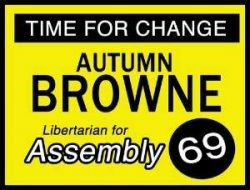 « Assemblyman Allen to host a Holiday Open House tonight in H.B. I would come but Lou drunk all the booze and there is none left for me.